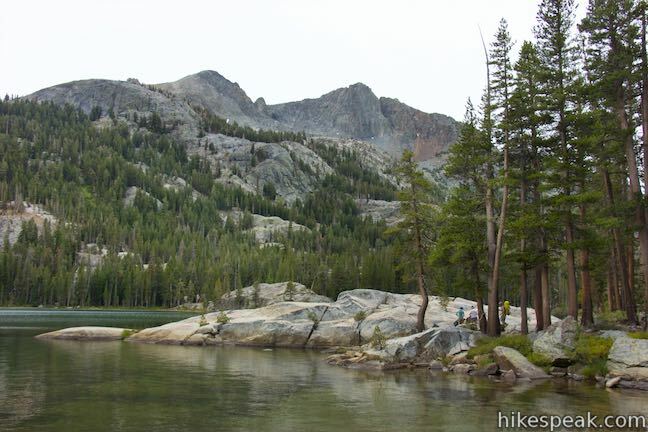 Get ready for Shadow Lake to step out of the shadows on this scenic hike in the Ansel Adams Wilderness of Inyo National Forest. 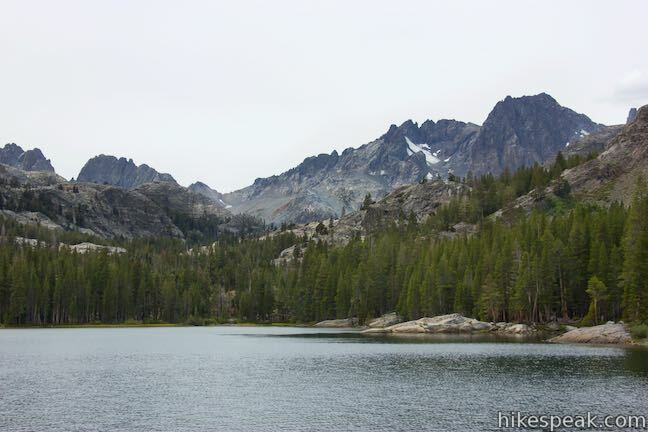 Shadow Lake is a beautiful mountain lake on Shadow Creek Trail about halfway between the trailhead at Agnew Meadows and Ediza Lake, a popular destination for backpackers and folks committing to a day hike of over 14 miles. 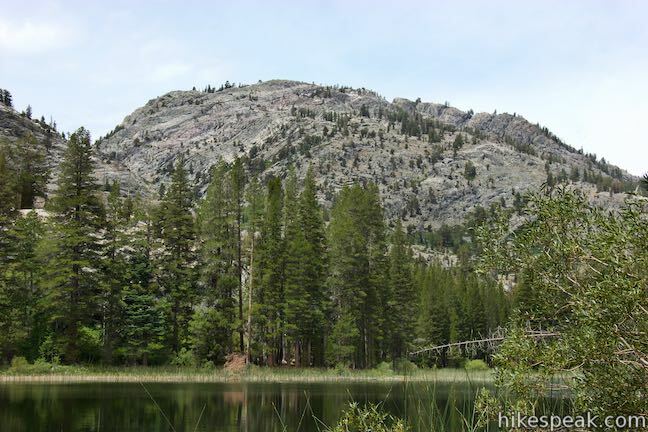 Shadow Lake is a worthwhile target on its own for a rewarding hike of around 8.5 miles round trip with 750 feet of elevation change. 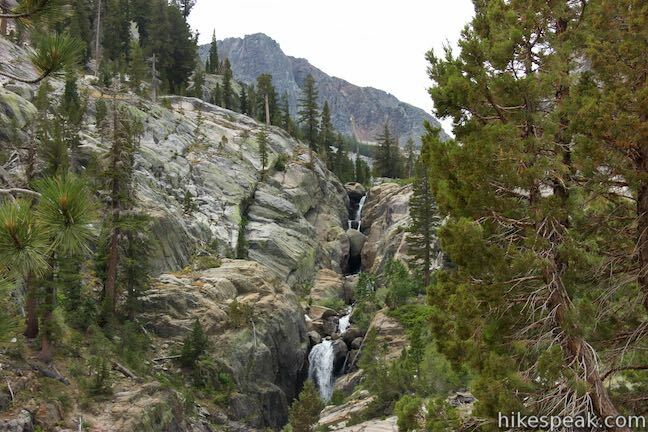 On the way to Shadow Lake, you’ll get sweeping views as you cross a canyon and ascend past a plunging cascade. 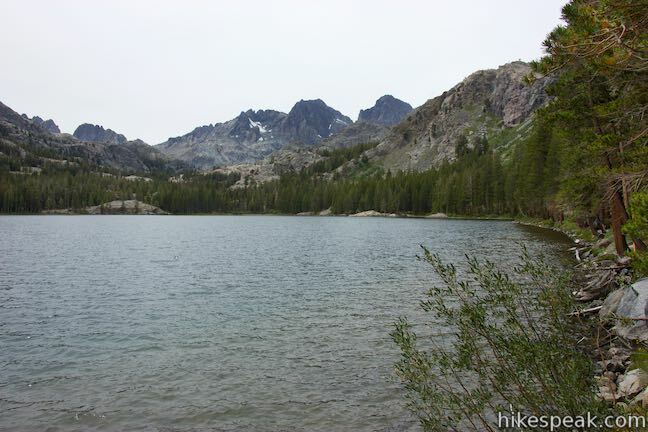 When you reach Shadow Lake, continue along the shore for satisfying views across the water toward surrounding mountains. 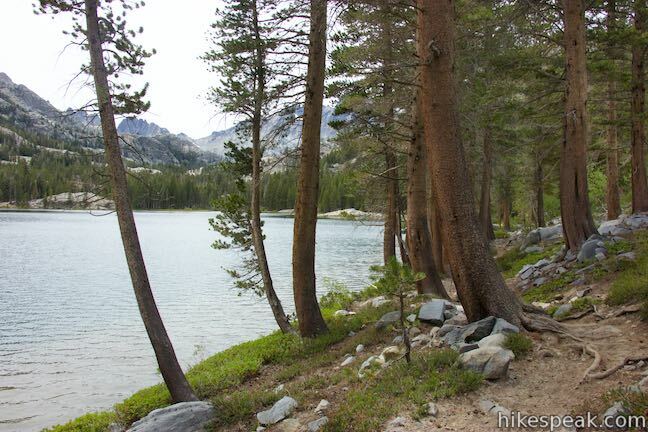 Find an ideal site to take a break by the lake’s edge before turning back or continuing on. 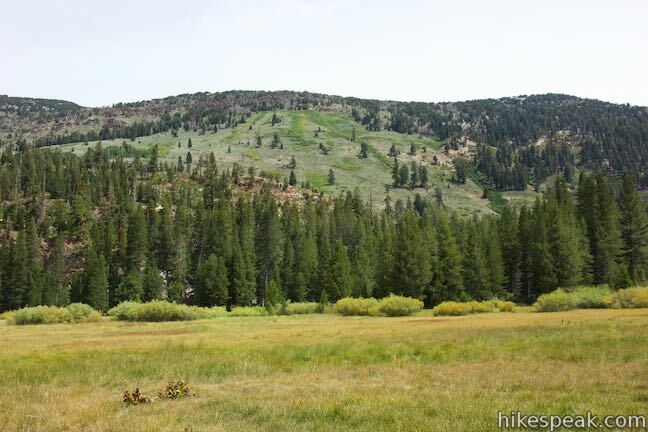 Start from Agnew Meadows near Mammoth Lakes, where a pack station services two trailheads for Pacific Crest Trail. 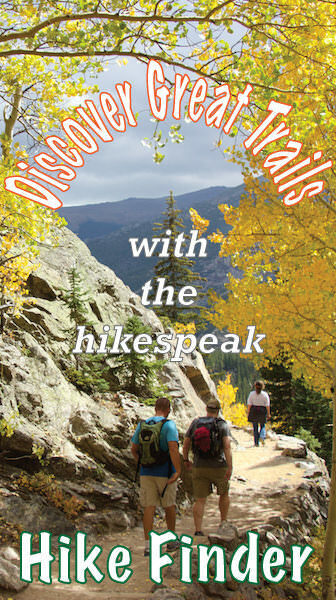 Pass by the northbound section of PCT called High Trail to reach River Trail. 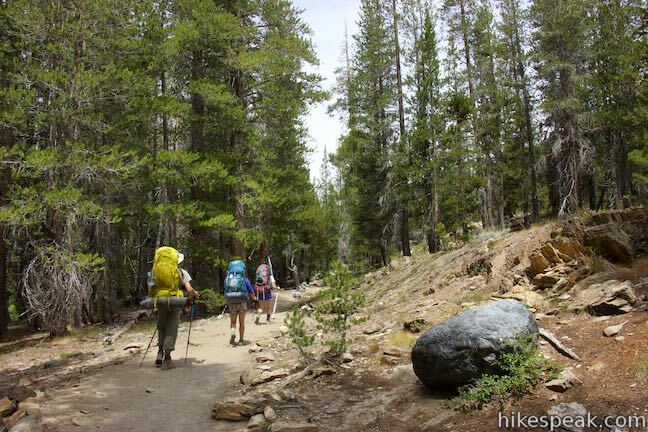 Through-hikers take River Trail for a short distance before turning south on the next section of PCT toward Reds Meadow and Devils Postpile. 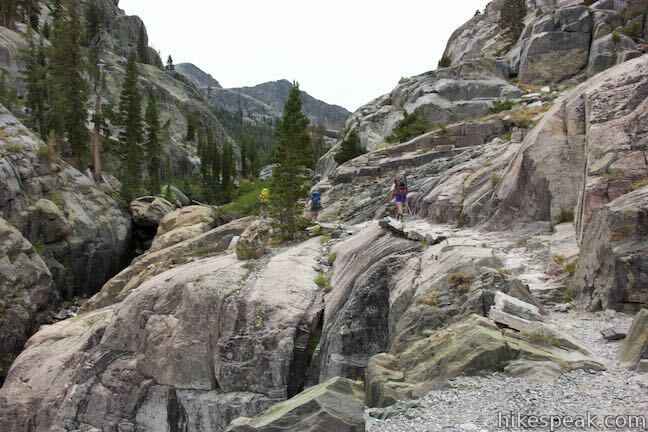 River Trail has more to offer though. 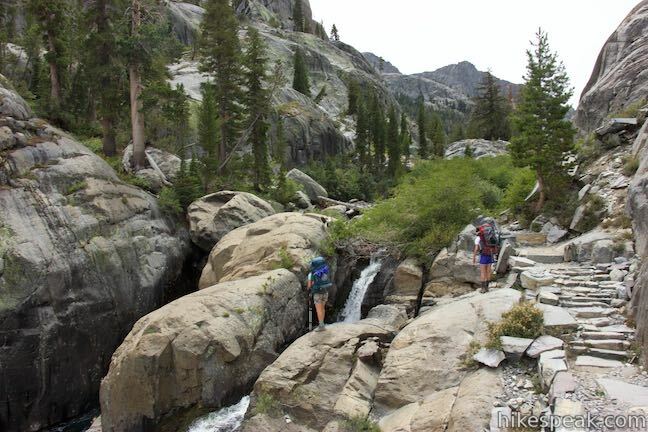 Take it down into a canyon to connect to Shadow Creek Trail on the way to Shadow Lake. 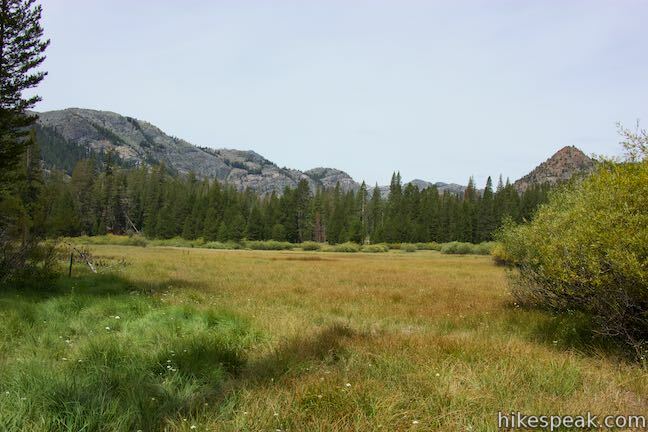 Cross a stream at the start of River Trail and hike along the edge of a grassy meadow bordered by a pine forest. 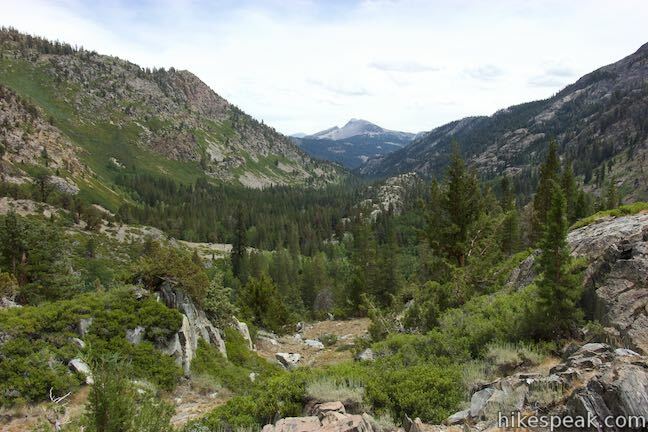 Across the meadow, rocky mountains poke out above the treetops to the north. 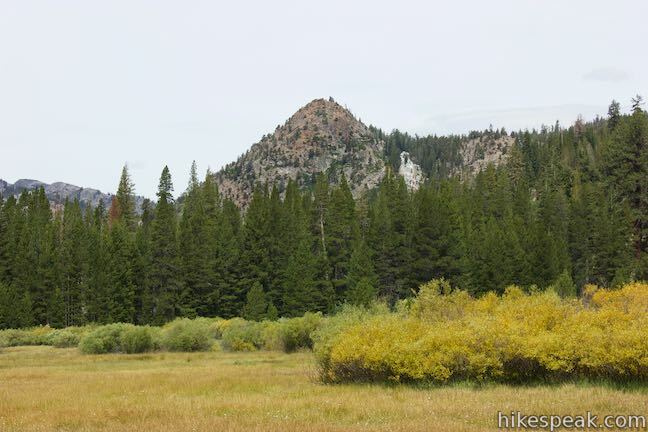 Leave the meadow, enter the forest, and pass an Ansel Adams Wilderness boundary sign at 0.85 miles from the start. 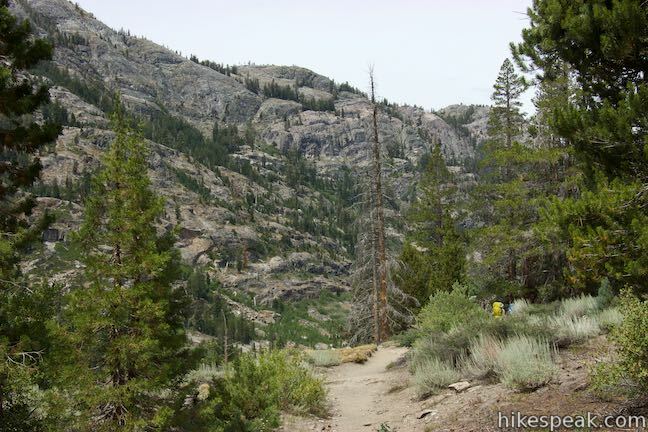 Just after that, you’ll hit a junction where Pacific Crest Trail separates from River Trail. 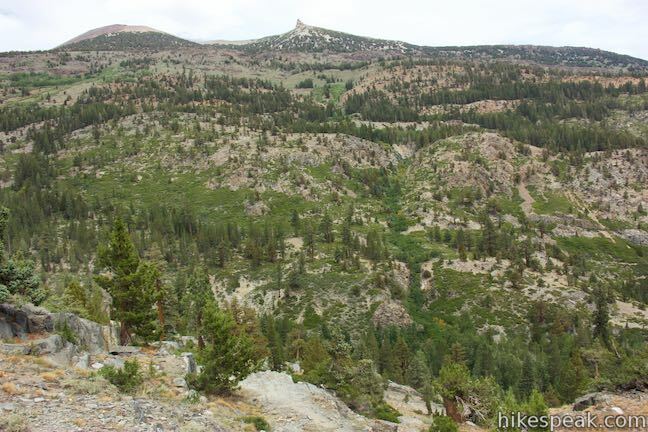 PCT parts to the left toward Reds Meadow. 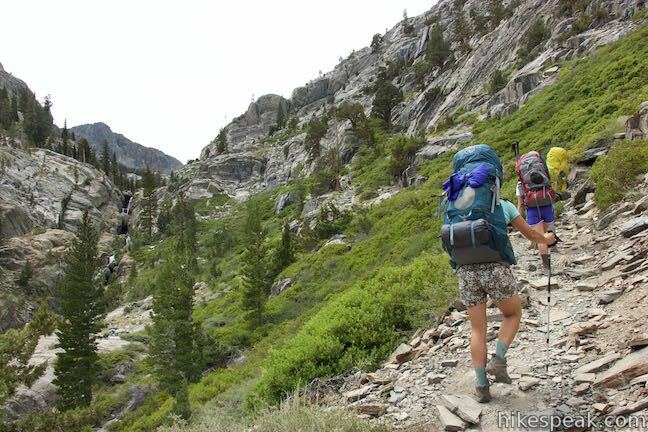 Continue straight, following a sign for Shadow Lake. 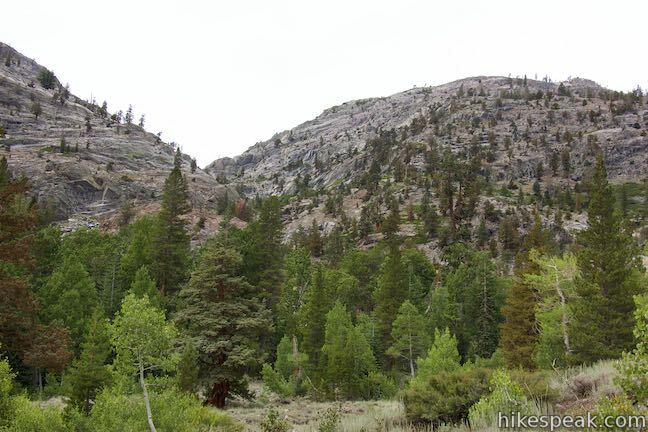 The views open up as you remain on River Trail. 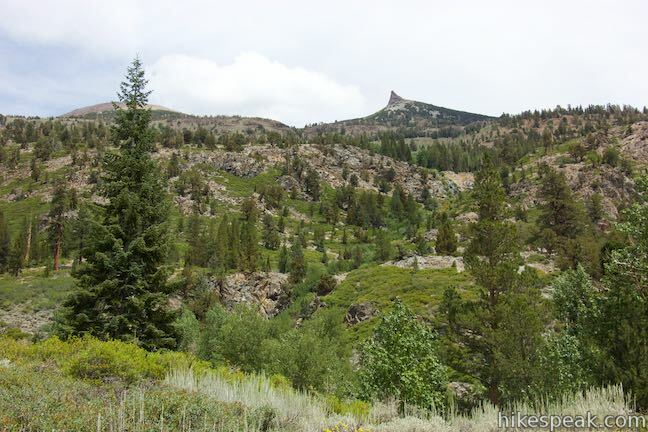 Just past the junction, the forest drops away dramatically as you come to the rim of a canyon carved by the Middle Fork of the San Joaquin River (the same river that flows past Devils Postpile). 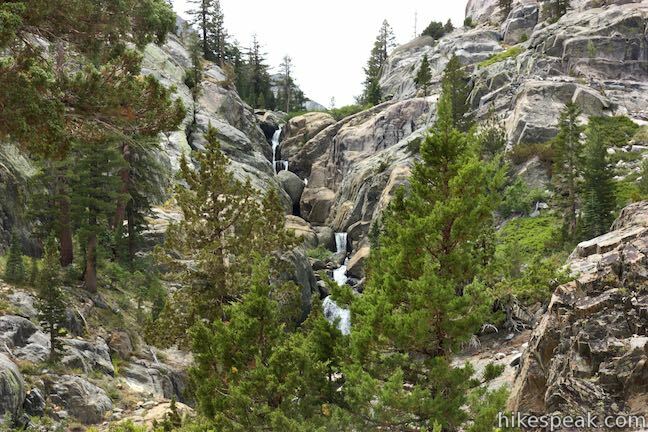 Over the next 2/3 of a mile, River Trail cuts a gradual path down the steep canyon wall toward the forest-covered canyon floor. 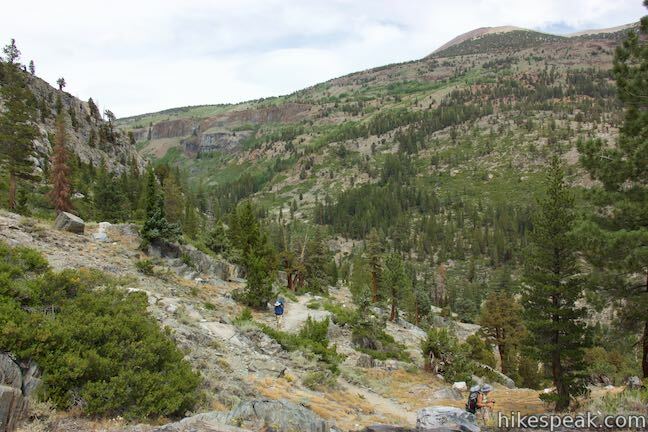 The other side of the canyon is backed by an even taller ridge and you’ll have broad unimpeded views up and down the canyon as you descend. 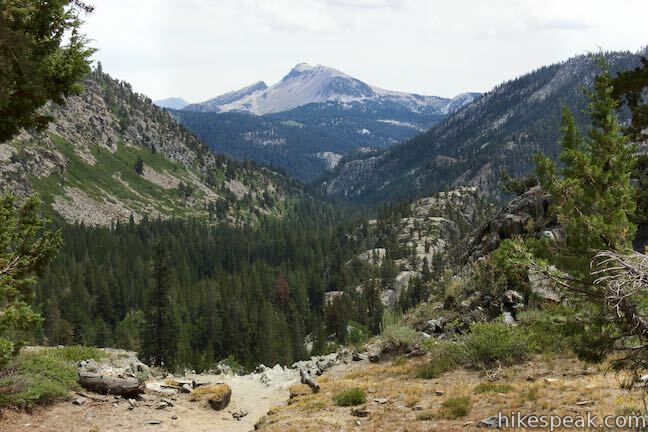 Look south to catch sight of Mammoth Mountain, a bald peak topped by ski lifts. 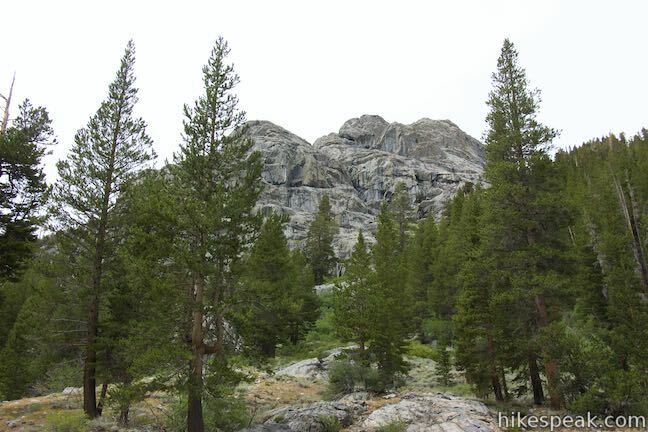 The summit has cell towers on top too, so you should have coverage any time the mountain is in view. 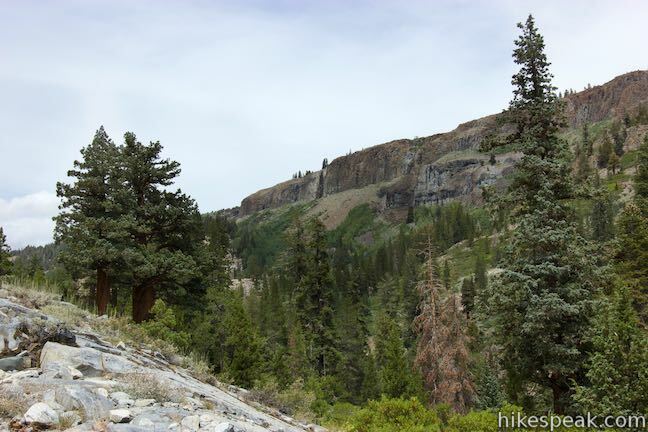 Reach the forest at the bottom of the canyon and come to a junction with another trail to Reds Meadow, 1.55 miles from the start. 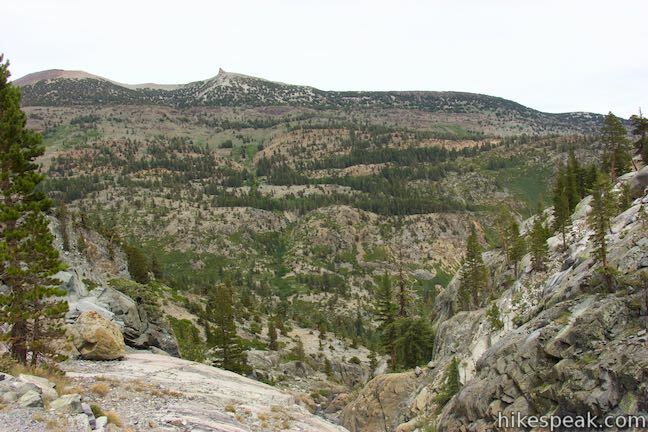 The trail on the left heads south along the bottom of the canyon. 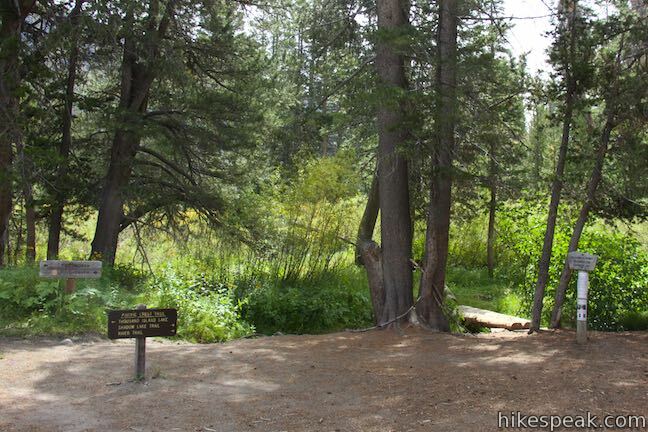 Stay to the right on River Trail as it heads up the canyon through a soothing forest. 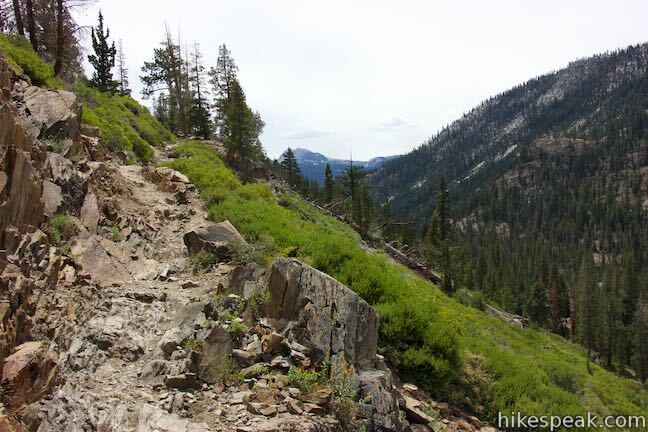 This next section of trail is level and easy. 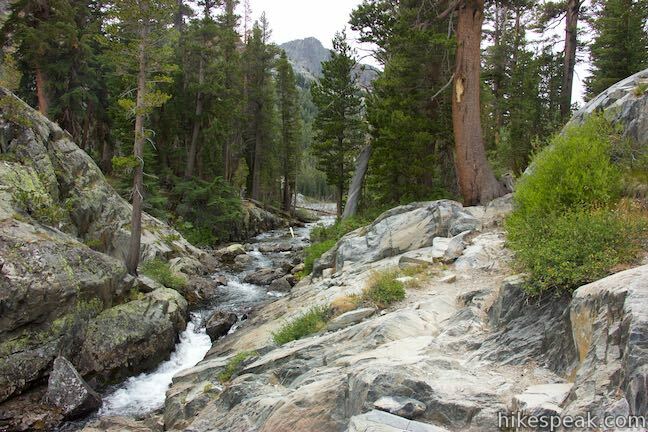 You won’t really see the river from this part of River Trail, but you will come to a small lake. 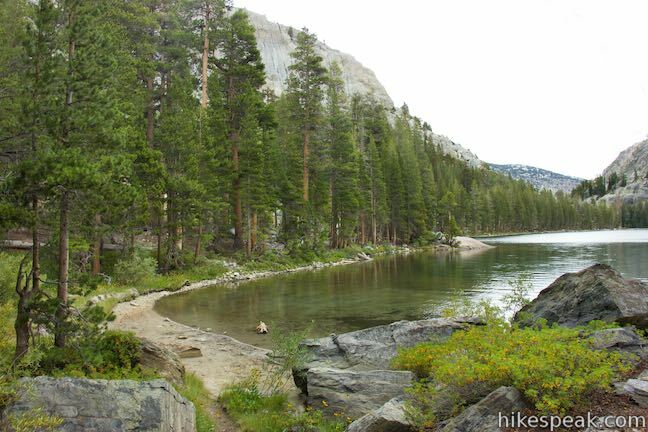 River Trail passes Olaine Lake, 2.15 miles from the start. 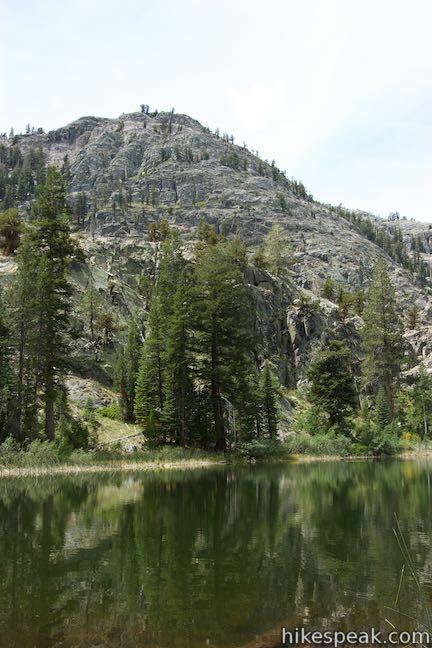 The green lake is wrapped by pines and backed by stone bluffs. 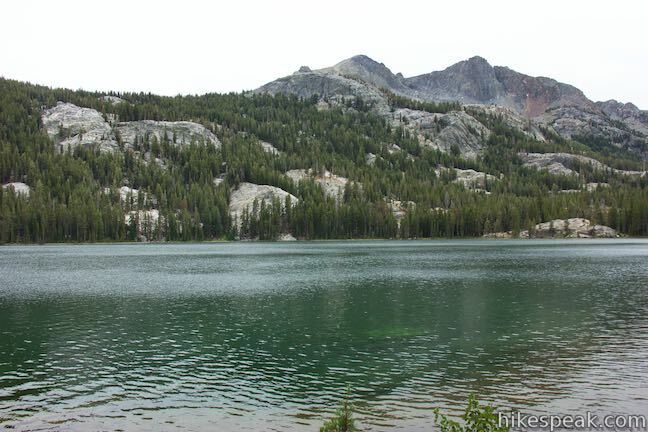 Look across the lake to the northwest to spot a gap in the rocky ridge. 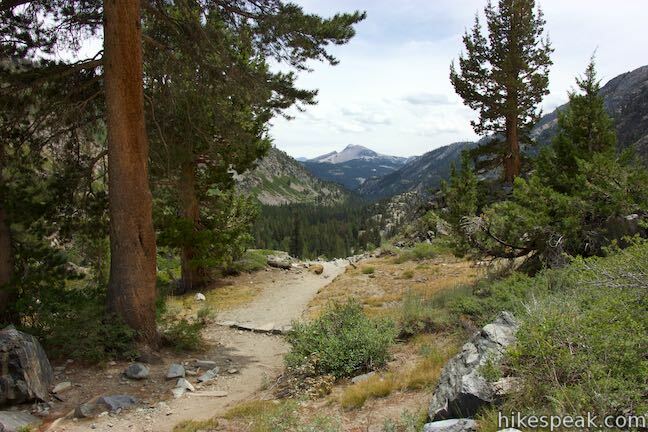 This is the corridor for Shadow Creek Trail, you’re route to Shadow Lake. 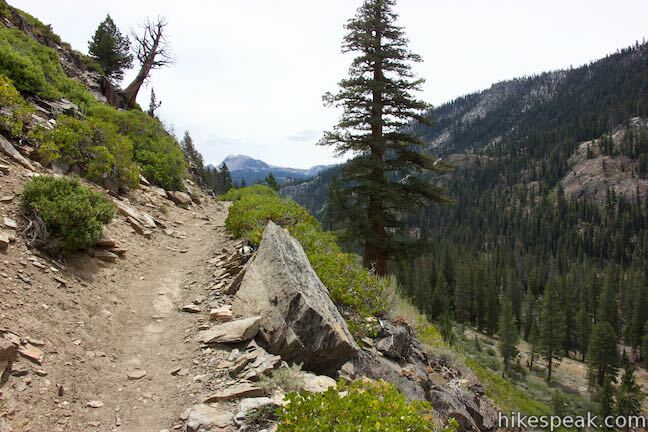 Past Olaine Lake and after 2.5 miles on River Trail, come to a junction with Shadow Creek Trail. 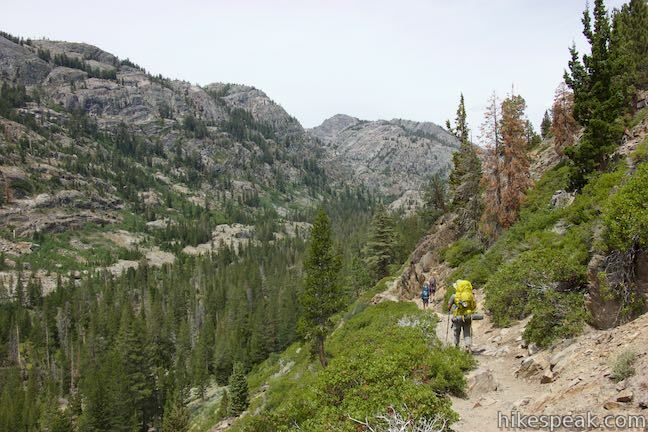 Turn left, following the sign for Shadow Lake. 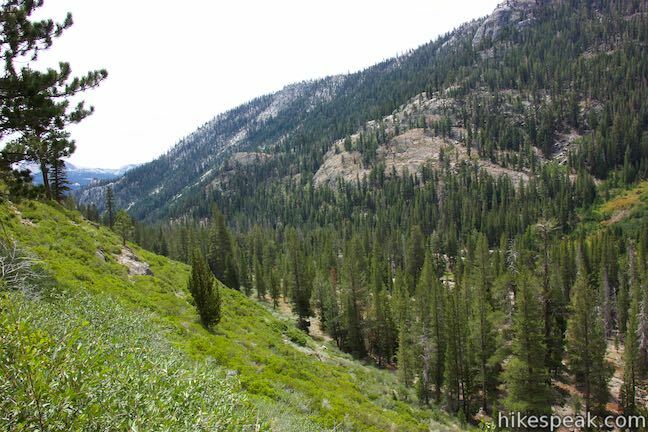 Hiking through a clearing, you’ll observe that you’re heading right toward the dip in the ridge. 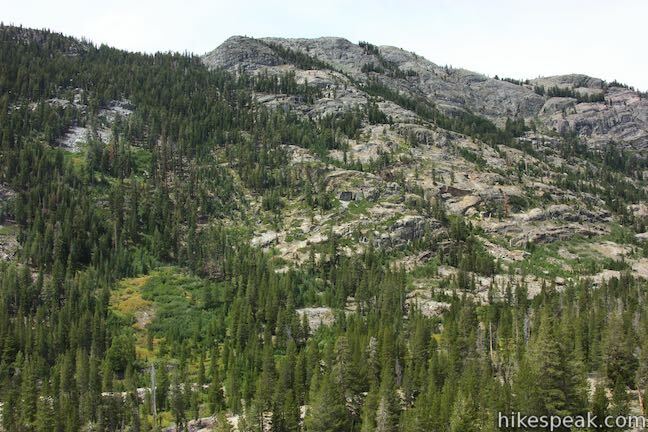 It’s a good thing that gap is there, but it’s still going to be a legitimate ascent to Shadow Lake. 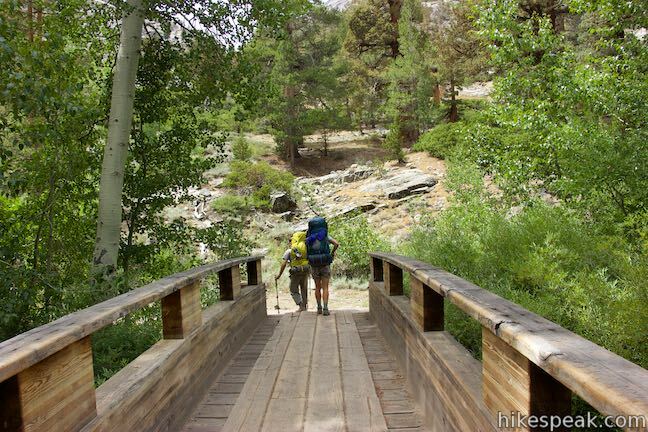 Reach the west side of the canyon and cross a sturdy bridge over the Middle Fork of the San Joaquin River. 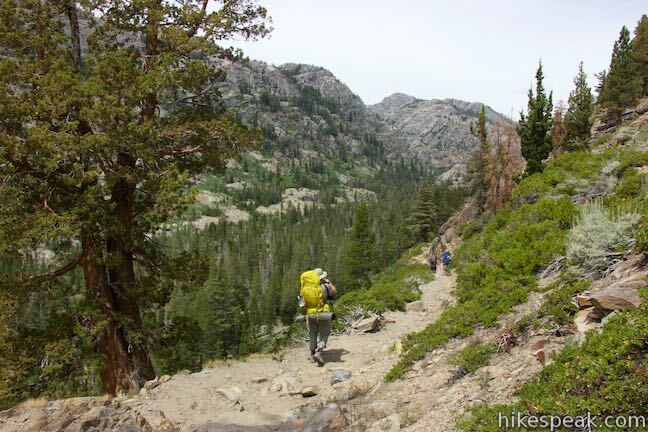 On the other side, the trail turns to the left and then makes a sharp turn to the right to begin ascending. 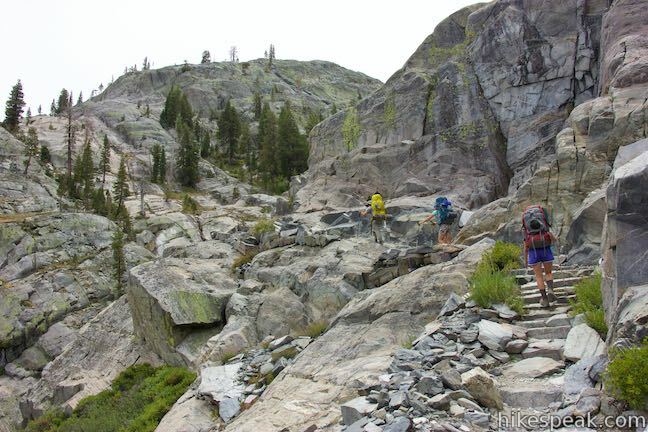 Stone steps are built onto the bedrock and switchbacks keep the grade manageable. 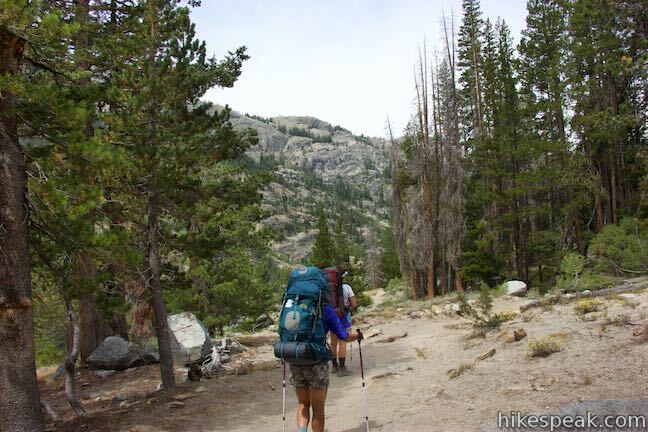 You’ll put in some good effort on the way up, especially if you’re carrying a heavy pack. 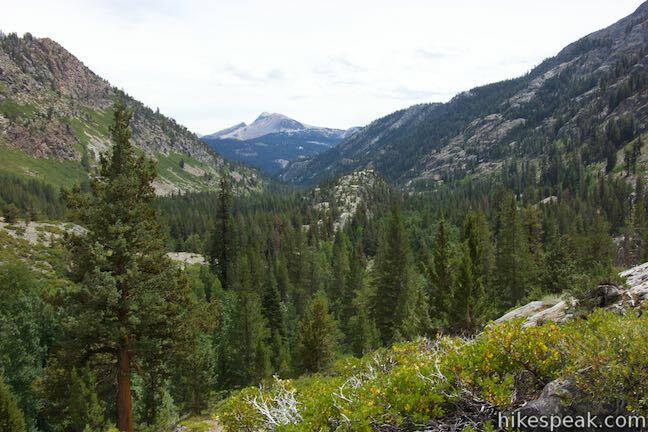 As you rise above the trees, enjoy views back toward the east side of the canyon. 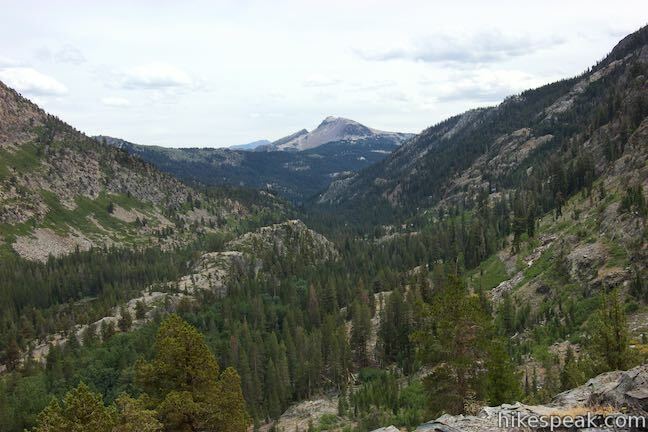 Looking down the canyon to the south, Mammoth Mountain is perfectly framed by forest ridges. 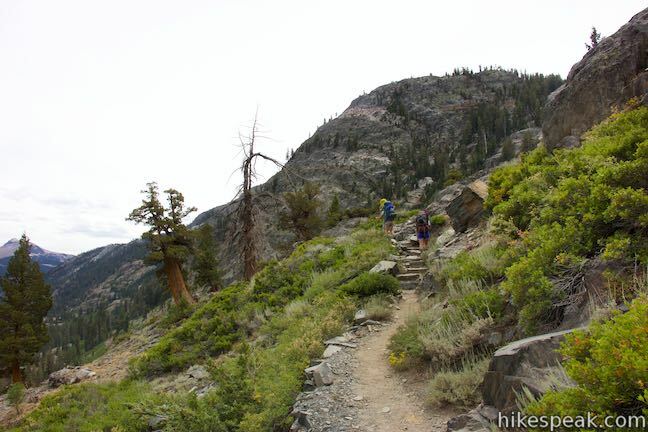 Ascend the west side of the canyon through boulders, low brush, and junipers. 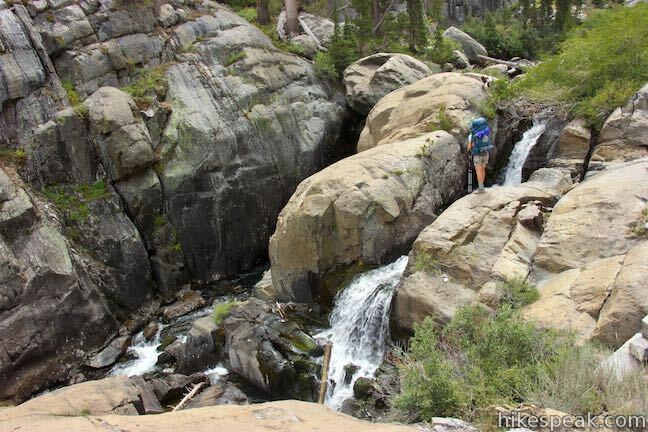 After about 0.7 miles of climbing, you’ll catch a welcome sight, the cascade flowing down Shadow Creek. 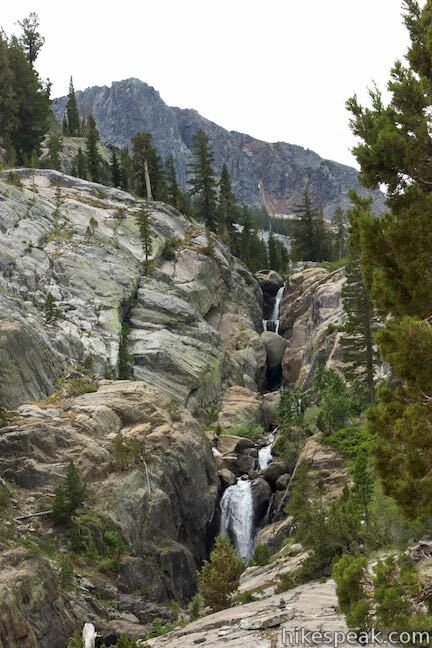 Water tumbles over large boulders on a series of lovely drops. 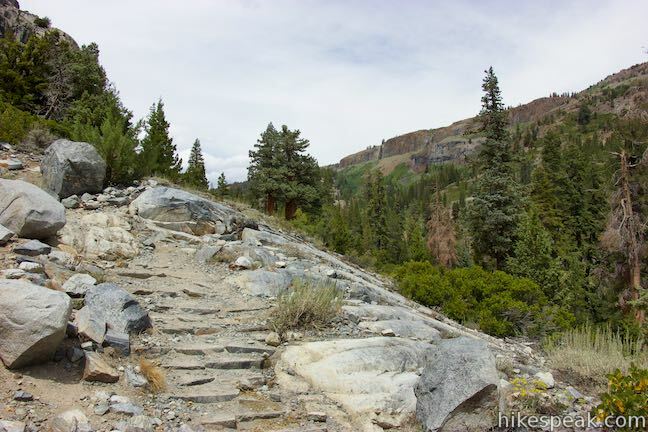 You’ll be motivated to push up the trail over more stone steps, getting closer to the cascade and the gap in the ridge. 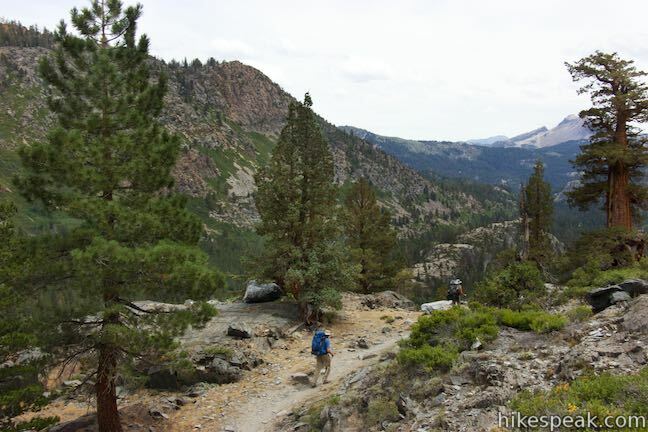 The trail goes right alongside the brink of the cascade, 1.25 miles up from the bottom of Shadow Creek Trail. 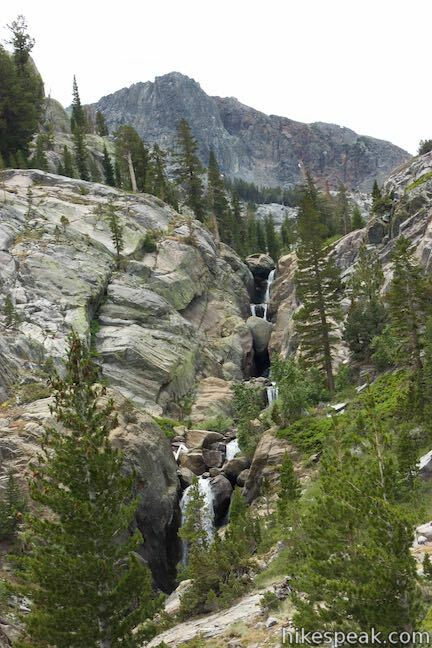 Stop here if you want to cool off by the tumbling stream. 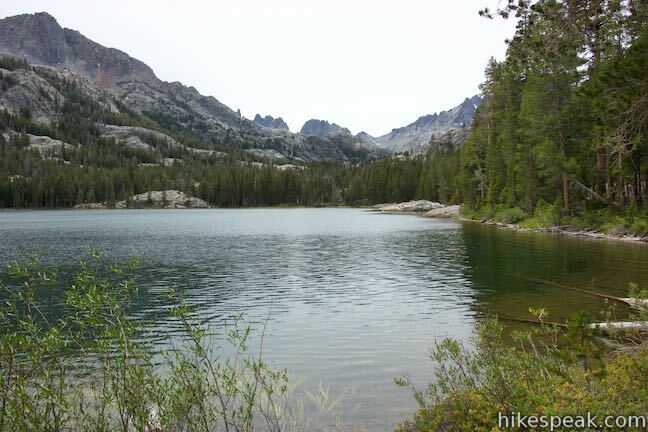 Otherwise, keep heading up the trail because Shadow Lake is just a tenth of a mile upstream. 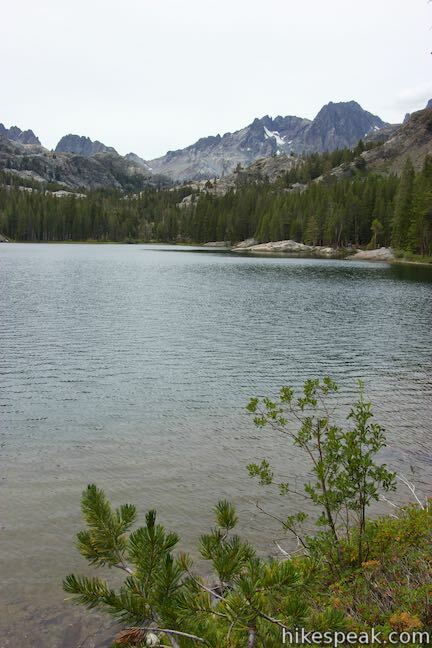 Reach the outlet of pine-wrapped Shadow Lake at 3.85 miles from the trailhead at Agnew Meadows. 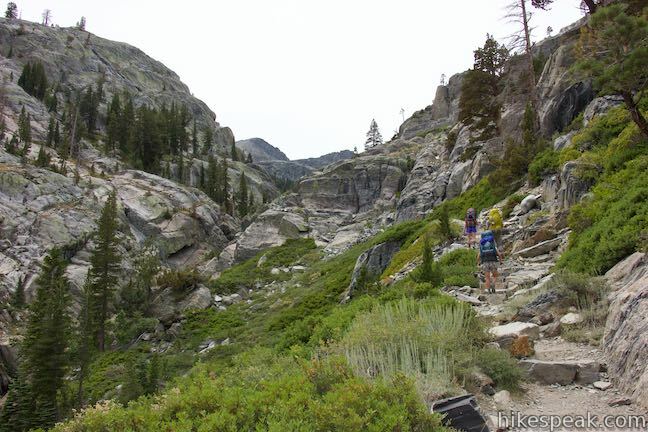 After the ascent out of the canyon, you may be in the mood for a level lakeside stroll. You got it! 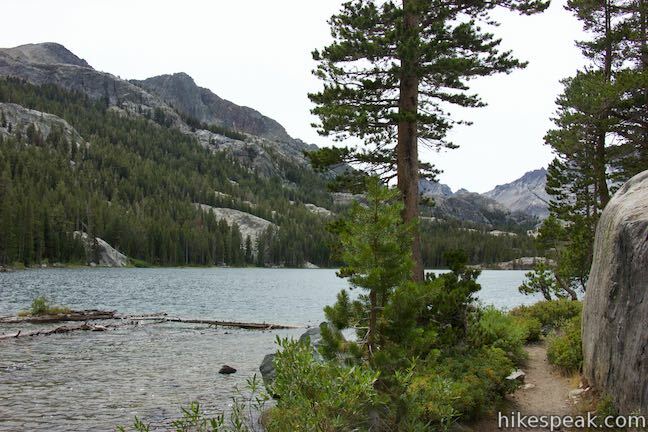 The trail hugs the shore of Shadow Lake over the next half mile before picking up the stream that flows into Shadow Lake to take that up to a junction with John Muir Trail, 4.55 miles from Agnew Meadows. 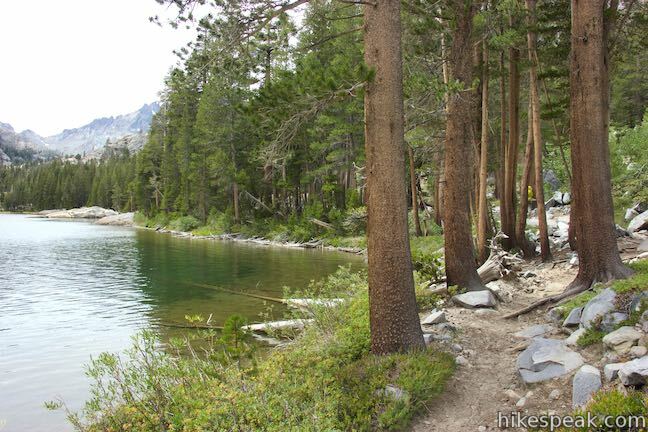 As you hike through trees along the north side of Shadow Lake, you’ll probably wish a canoe would magically appear so that you could paddle around the lake. 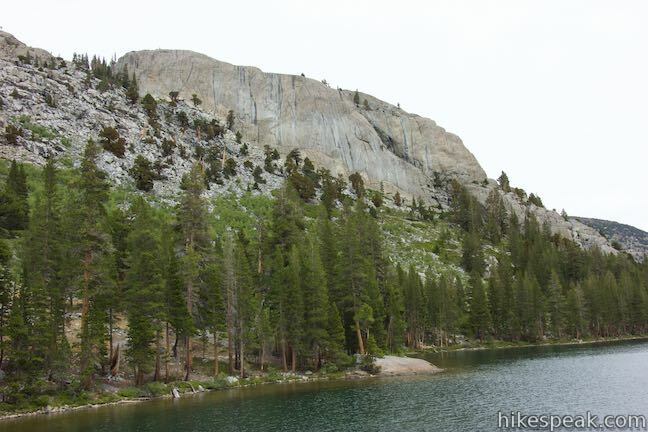 A rocky ridgeline rises above the pines on the far side of the lake. 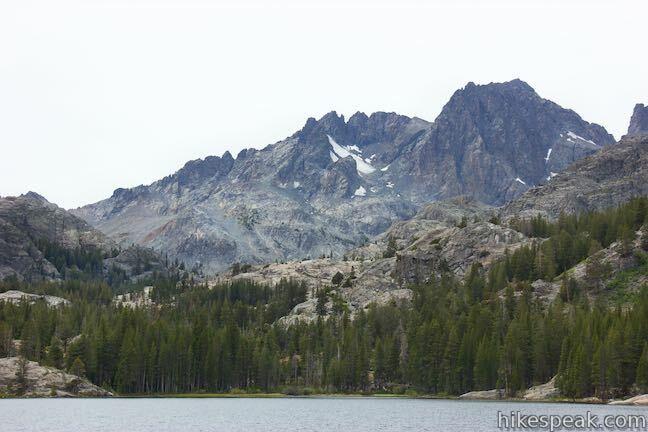 Moving farther down the shore, you’ll spot higher peaks to the west. 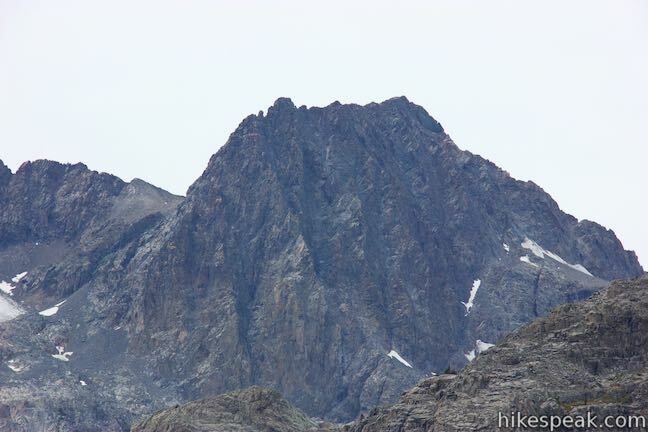 The soaring 13,143-foot summit of Mount Ritter rises above the rest. 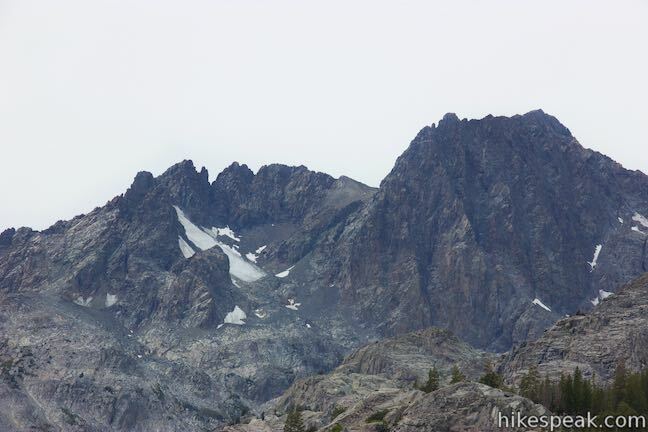 South of that you’ll see the jagged ridge of the Minarets. 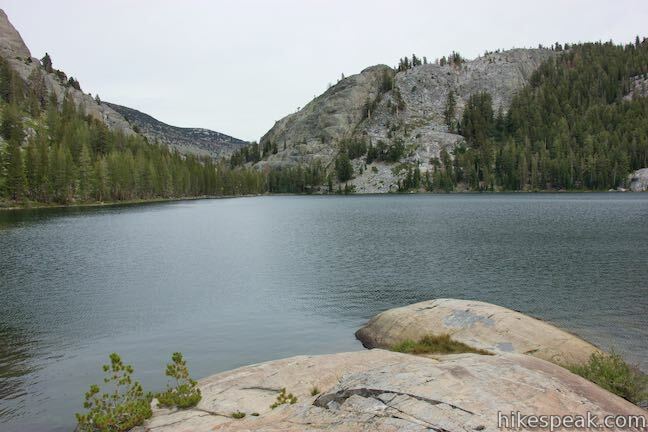 Boulders on the shore of Shadow Lake make nice places to sit down for breaks. 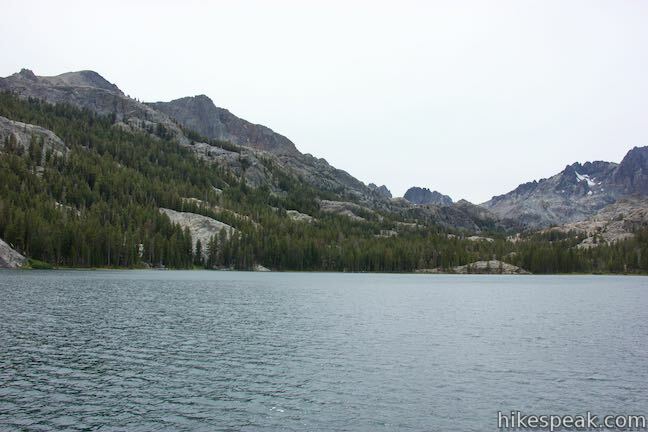 As you go around a small sandy cove on the northwest side of the lake, a path breaks off to the left leading to a rocky point that juts into the lake. 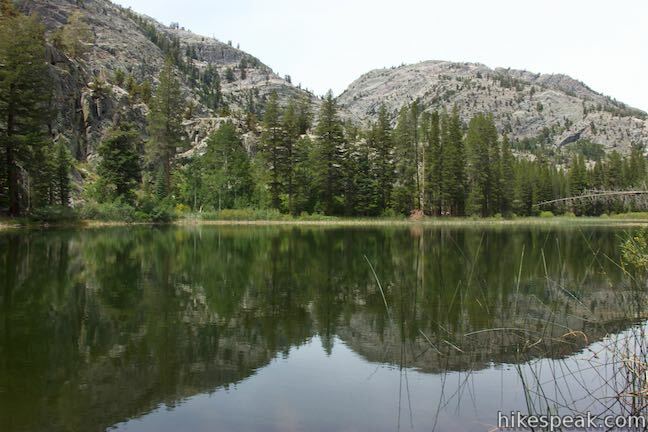 If you venture off trail to the point, you’ll discover an ideal spot for taking in Shadow Lake and its surroundings. 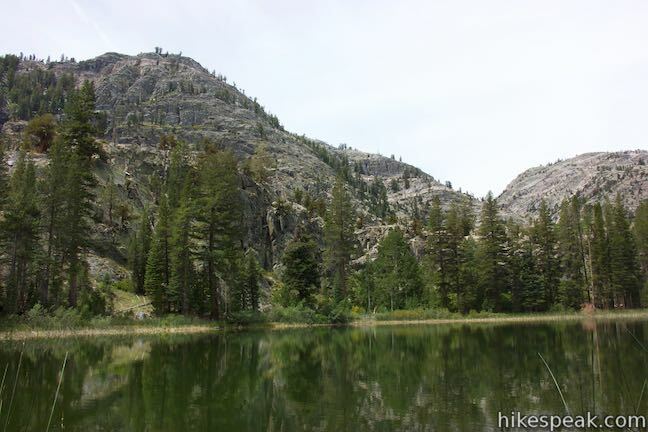 Shadow Lake is a fine destination for a fulfilling day hike and an ideal lunch site on the longer trek up to Ediza Lake. 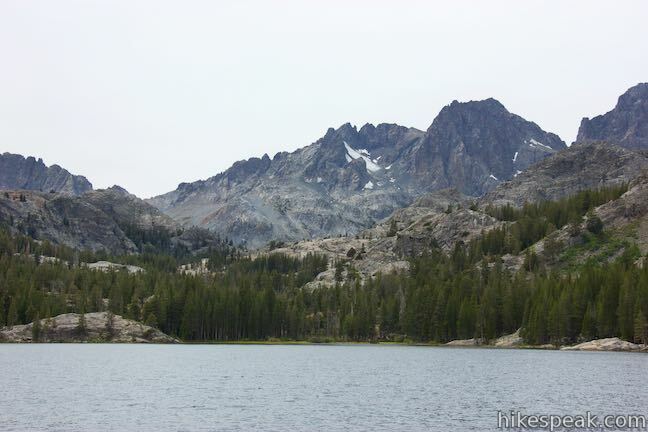 If Shadow Lake is your day-hiking destination, you can turn around here. 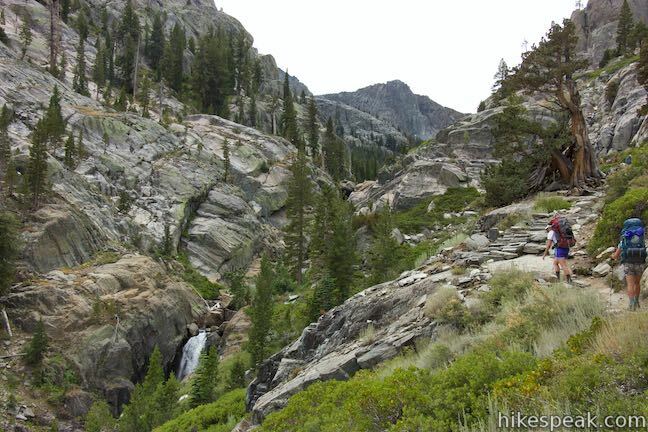 Otherwise, continue up Shadow Creek Trail, which borders the tumbling creek flowing into Shadow Lake. 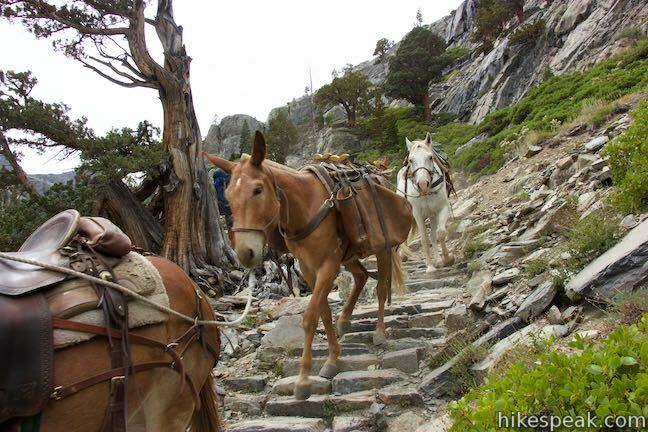 The trail soon comes to a T-junction with John Muir Trail. 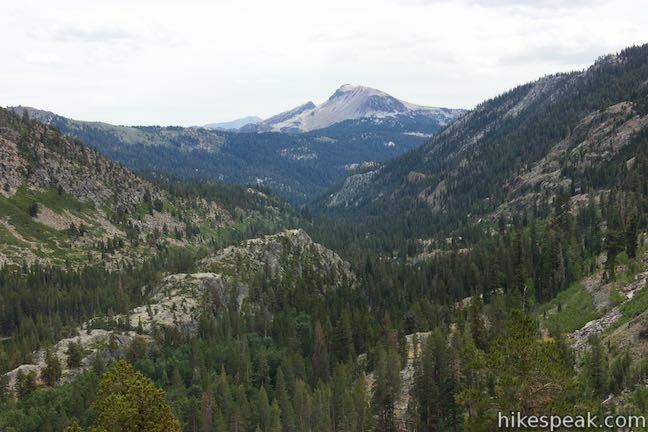 To the left, JMT crosses a bridge and goes south toward Devils Postpile National Monument. 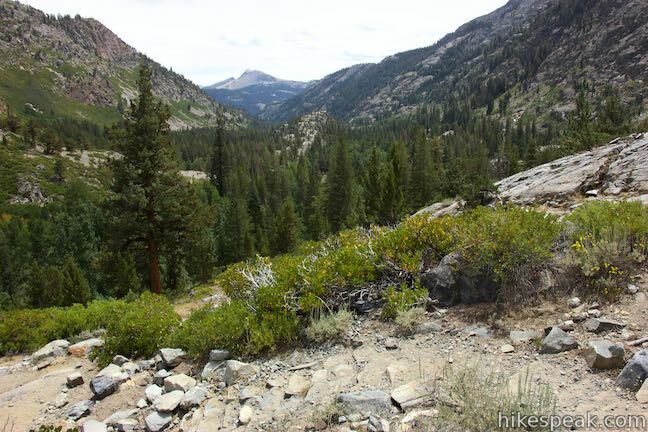 To the right, JMT aims toward Yosemite National Park. 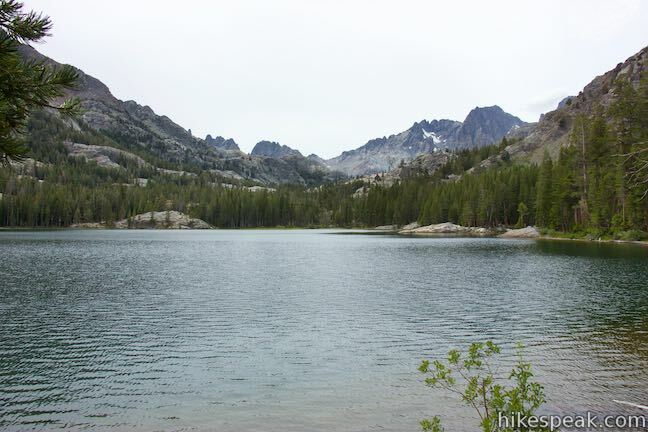 Turn right to take John Muir Trail to a junction with the next section of Shadow Creek Trail heading to Ediza Lake or to continue on JMP to Garnet Lake and Thousand Island Lake. 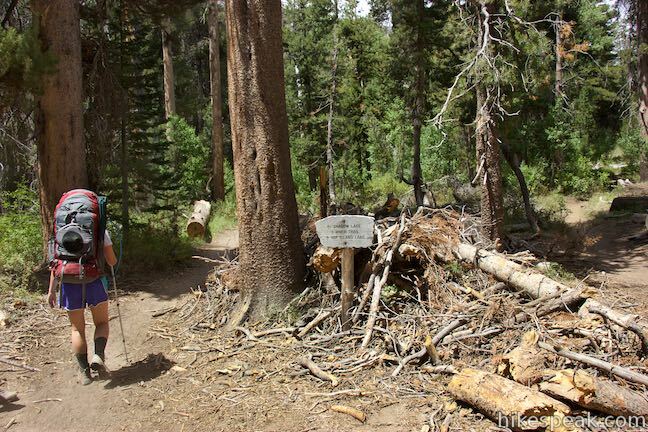 Dogs are allowed on leashes on the hike to Shadow Lake. 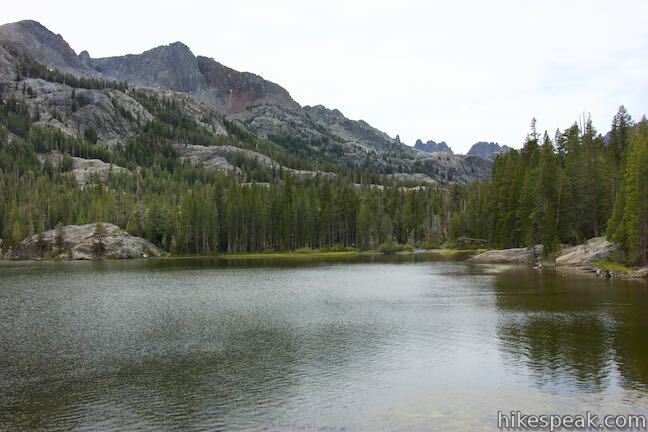 Overnight camping is not allowed around Shadow Lake or along Shadow Creek between Shadow Lake and Ediza Lake. 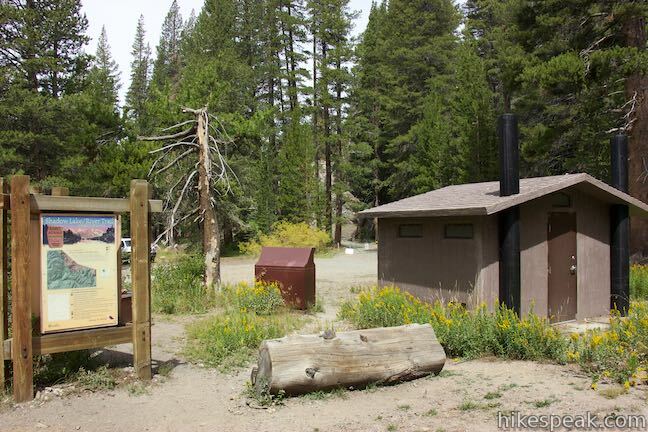 The trailhead has a small parking area, toilets, and a bear-proof storage locker. 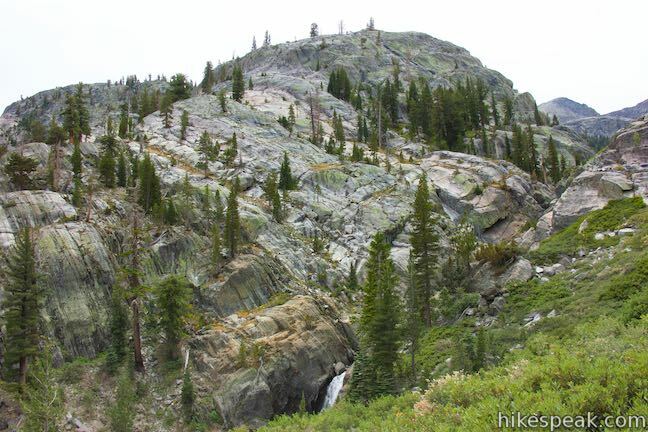 No permit is required to day hike in Ansel Adams Wilderness. 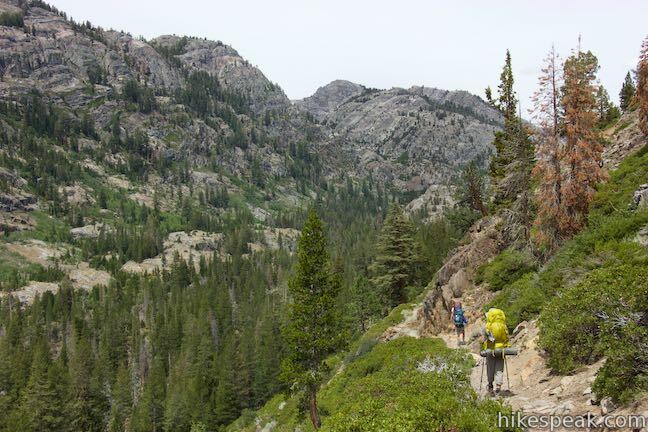 A permit is required for any overnight trips and a trail quota is in place. 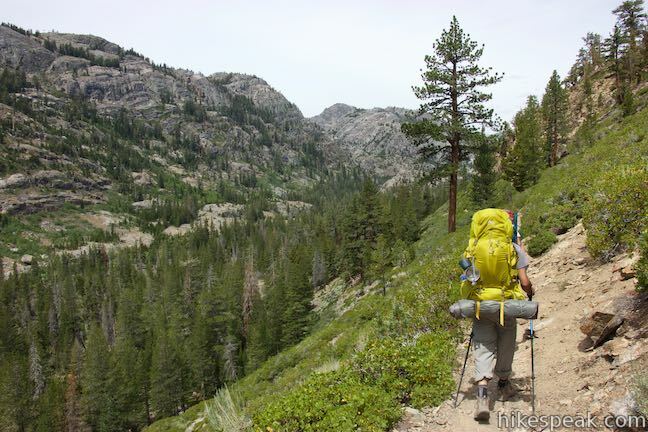 The 18 daily permits for Shadow Creek Trail that can be reserved in advance book up quickly. 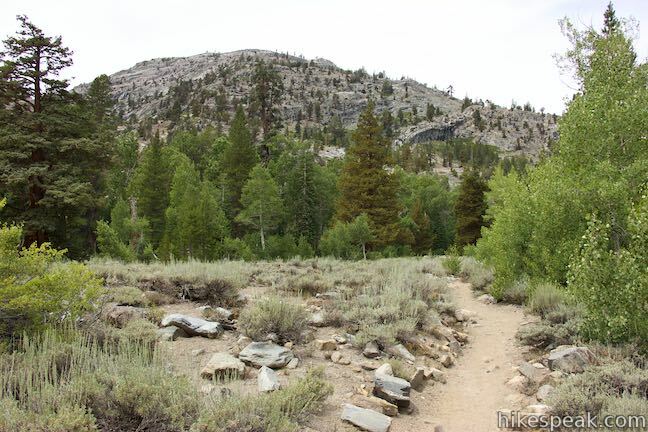 The other 12 walk-in permits can be obtained at Inyo National Forest Ranger Stations starting at 11 a.m. the previous day. Arrive earlier than eleven, take a number, and wait in line if you are determined to get a walk-in permit. 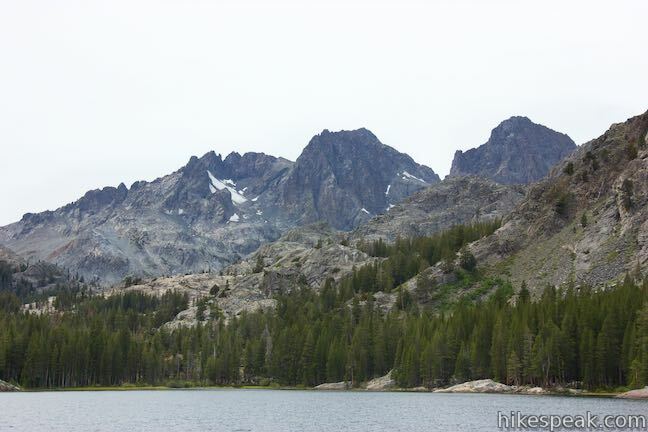 Mammoth Lakes Welcome Center is the nearest Inyo National Forest Ranger Station. 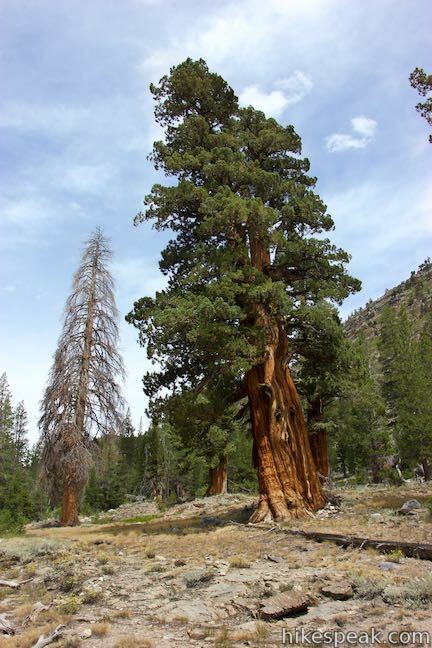 The center is open daily from 8 a.m. to 5 p.m. and distributes permits and rents bear-proof canisters. 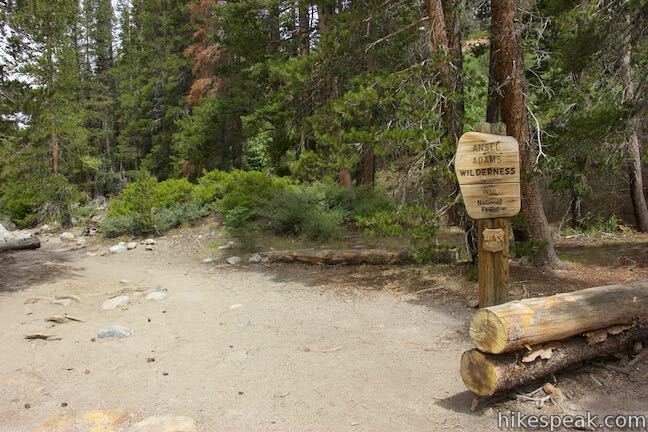 The ranger station is located at 2510 Main Street (Route 203) on the road into Mammoth Lakes.